Delphi was the location of the most famous oracle of ancient times, and was considered to be the center of the Earth. The (female) oracle, seated on a tripod over a fissure in the earth, breathed in vapors released from seismic activity at the site, and then made her predictions. They were often enigmatic, but were sought after by both the nobles and the common people. The site was appropriated by the (male) priests of Apollo, and became a place in which the various Greek City-States boasted of their accomplishments and their power with ever-greater architectural erections. A shopping center, a stadium, and a theater (pictured) complemented the temple. The oracle remained, to draw the people, and she was available on nine Fridays each year. 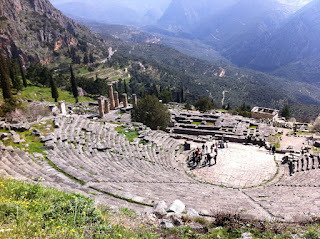 To best experience Delphi, eschew the guided tours and the explanations and go to the heights. There, the strange and peaceful power of this place remains.